A few weeks back I received an email from Todd Berryman, a radio host at 92.3 WTTS FM in Bloomington, Indiana. 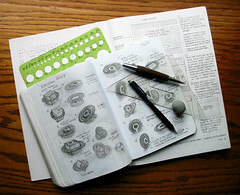 Todd found me because I use Miquelrius notebooks daily for logo, icon and web design work. He wanted to know where I buy mine, as he was having trouble finding them at his local Barnes & Noble. Since I'm on my last Miquelrius sketchbook, this issue hit close to home. I haven't found them at my local B&N either. I figured they were simply out of stock. This email got me thinking — I should really locate a good online source for Miquelrius notebooks. Just in case. Todd mentioned ShopMiquelrius.com, the online store for Miquelrius USA. Sure enough, they have a good selection of the soft-cover books I love so much, and several other options as well. From Oops to Oh Yeah! I ordered 3 green notebooks, but accidentally chose lined books instead of gridded. I immediately emailed the ShopMiquelrius help desk and within hours, I had personal emails back from Jennifer and her staff, letting me know they would take care of the error. Wow, that's what I call service! I'm ordering all of my Miquelrius notebooks from ShopMiquelrius.com from now on. Yeah, they sell the notebooks I need at a decent price, but what sold me was how well they treated me, and how quickly they solved my problem. Because of my personal contact with Jennifer, I asked if they happened to have an affiliate program for their products. Since I use the products and love ShopMiquelrius's service, why not share the resource with others and earn a few dollars leading buyers to them? Jennifer said they didn't have an affiliate program in place, but she was very intrigued by the idea. After a little research and requests of the director, she got the green light to launch a trial affiliate program for 3 months. Very cool! Today their new trial affiliate program is live on the site. Seeking a good source for Miquelrius notebooks? I invite you to try ShopMiquelrius by using my affiliate link. P.S. I wasn't paid to write this post, didn't receive any free notebooks, and have only signed up for the affiliate link a few moments ago. I'm just a very happy customer who wants to share this great resource with other Miquelrius buyers, and to help ShopMiquelrius.com grow and thrive. It's the least I can do. P.P.S. Just got word from Jennifer that ShopMiquelrius is having a Thanksgiving sale: 10% off all purchases for registered, logged-in users, from Noon EST November 15th through 11:59 PM on November 18th. To get the discount, use the code THANKS07. I currently have a leather-look 4.5"x6", 300 pager for taking notes at conferences and user groups. I find it too bulky. It's fat. And trying to fold it over to take notes comfortably is not really possible. Judging from your past reviews you're a 6"x8", 200 page guy? Do you use the fronts and backs of each page? So perhaps my question is - what book do you carry to conferences? I use the 6x8 300 pager. I used the front and backs of pages most times, but at times I skip. For web design I like an A4 sized grid book I picked up in Germany, made by HIG. It might be worth checking out the Rhodia line as well as they have nice size options. I too felt the proportions of the small Miquelrius books were just off a bit too. Too fat for the width and height. As for my notes for conferences I like Moleskine notebooks and sketchbooks in pocket sizes. The paper is nice and smooth, especially the sketchbooks for capturing sketchnotes. Unfortunately, I've never been able to find HIG online. I'm sure it's out there - just haven't figured out the magic Google incantation.